For the Indian Cooking Challenge, this month, Vaishali got me a recipe for Raj Kachori, that was a mix of couple of other Raj Kachori Recipes. All these were from Rajasthani friends, so I knew it was going to be one of those delicious treats. Raj Kachori is a delicious Chat from Rajasthan, the interesting factor being that though the name has kachori, this hardly has any kachori in it. This is a huge gol gappa sort of chat, that is filled in with delicious items in it. 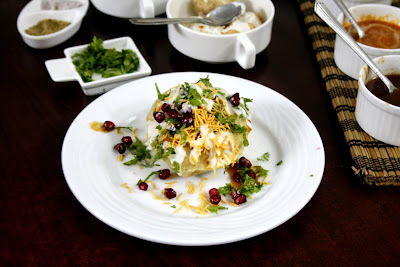 Essentially Rajasthani Raj-Kachori, is a stuffed katchori with potato and sprout filling and served with curd, chutney and sev. 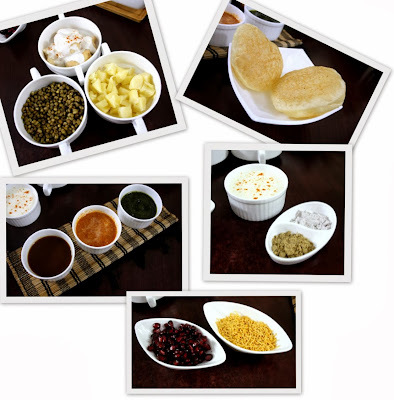 Apart from sprouts from Moong, chole, moth can also be used. This is a long recipe, and longer cooking time, and the longest clicking in my history, which included getting the cookery ready. Finally after one bite, it was all worth the efforts. This is among one of those chats I haven't already tasted, though I have heard about it many times. Somehow until I actually read about the recipe, I always thought this was like the regular Kachoris. 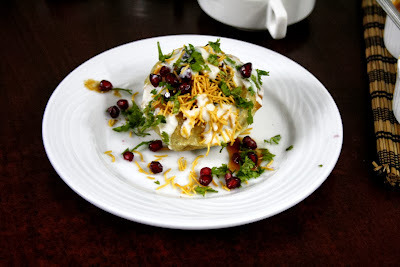 So it was all a big surprise when on reading I realized that the Kachori is actually a huge Gol Gappe or Pani Puri. See we seem to have done the kachoris, pani puris, now it's time to combine both and make Raj Kachoris! 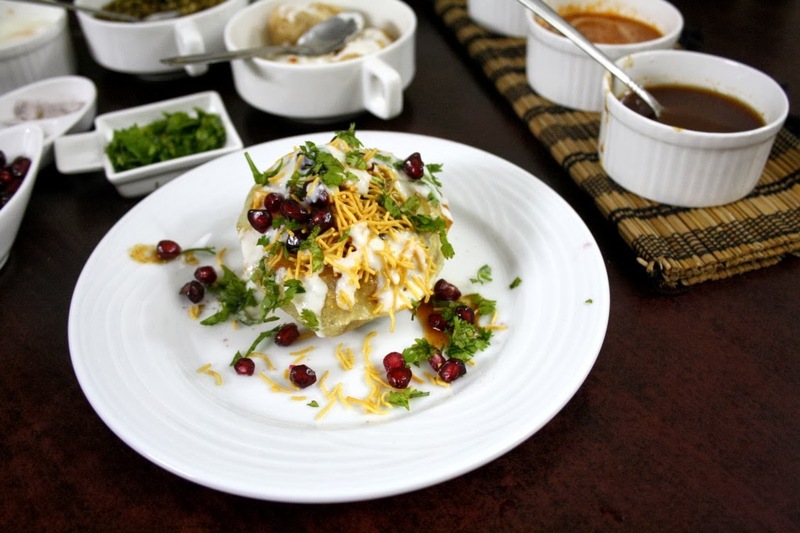 Though Vaishali and I have been discussing about this and she sent me this recipe some months back, as always there is no thrill or life is dull if I did it ahead right. So I live on edge trying to break my back, by making these complicated or rather long winding dishes at the last moment. And moreover until this morning it never struck me that I need to work on the pictures today! Originally planned on Saturday, it got pushed to Sunday. From about five in the evening, I was walking up and down, planning which one to do first. I knew each dish was a continuous process. I finally ventured and it went on. Through the process I realized it wasn't so hard, and you can get this done easily if you plan to do many of these things earlier. Like I had ground Urad dal batter ready. Instead of making Dahi Vada, I simply had hung curds, mixed up with sugar and a pinch of salt. Chilled it. I like my curds to be cold when served over chats. 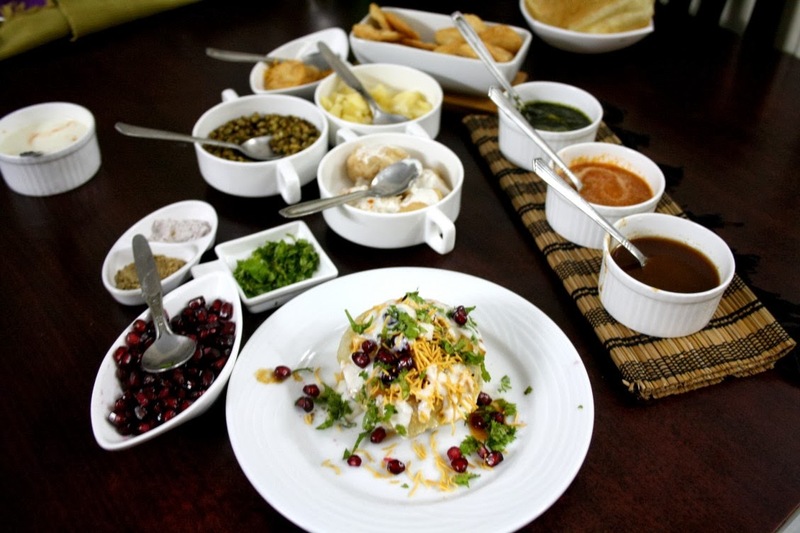 Dahi Vada, Boiled Moong, Boiled Potatoes, Fried Kachoris, Three different Chutneys. 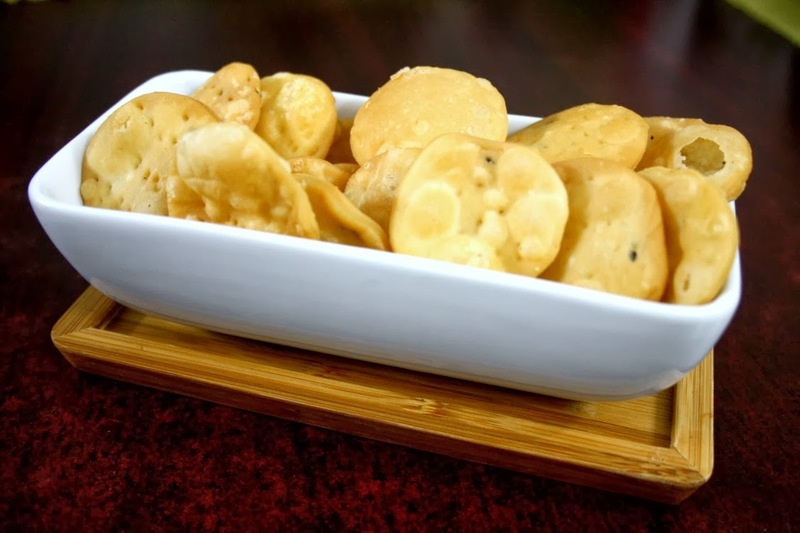 Hung Curds, Chat Masala, Kala Namak. 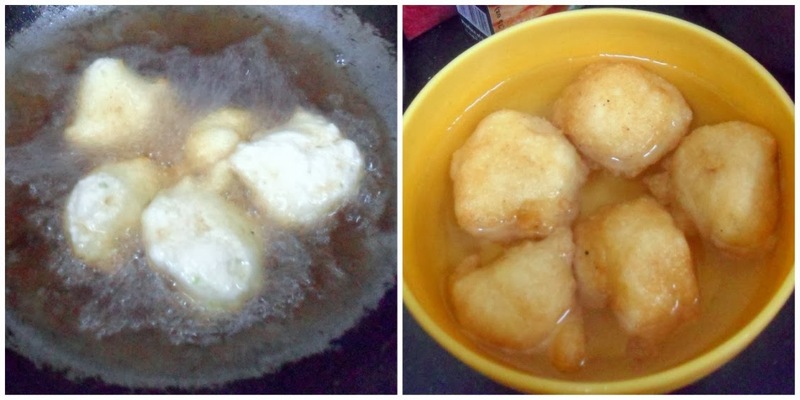 Vadas for the Dahi Vada, deep fried and soaked in hot water to make it soft. 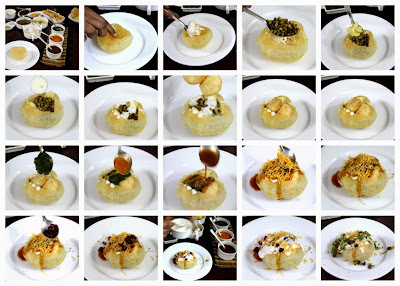 These are made as the regular Meddu Vada. I added green chili paste along with salt. No need to add all the spices or masalas as these are going to be stuffed in. Add baking soda and knead into a semi soft dough. Cover and leave for 30 minutes. Divide the dough into 14 parts and make balls. Flatten a ball and roll it into a disc about 3’’. 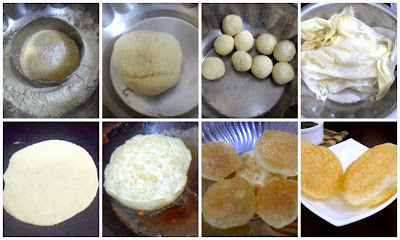 Deep fry , adjusting the flame from slow to medium and vice versa, till you get a real crisp golden kachori. 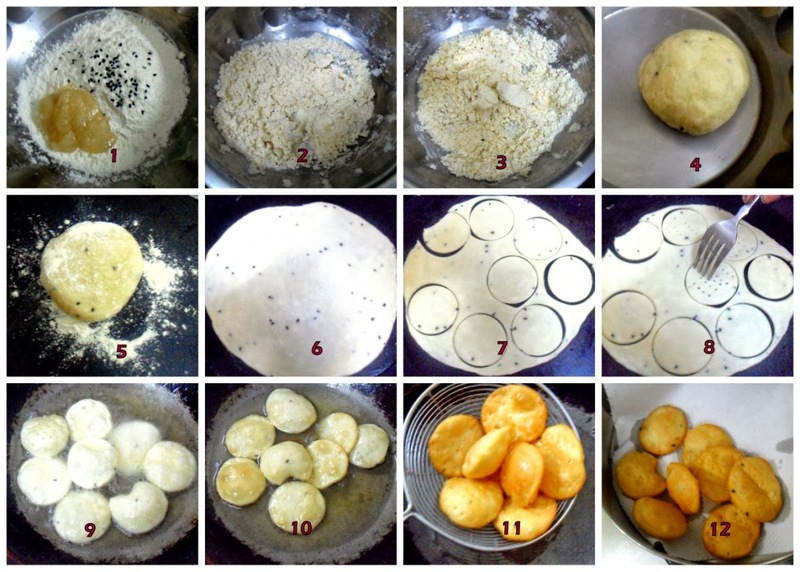 Make all the kachoris in the similar manner. Knead the dough again for a min. Dust and roll out a big thin rotis. Using a cutter, cut out small circles. Using a fork, mark on the top to ensure these don't puff up during frying. Heat enough oil for deep frying. It should be on medium high and once its hot, slide the padis into the hot oil and allow to cook. Flip over and fry the other side till light golden brown. Drain on to a kitchen towel. Note: Ensure the oil is hot enough before frying the papdi. If the oil is not hot enough, the papdi will absorb a lot of oil. This is what finally happened! 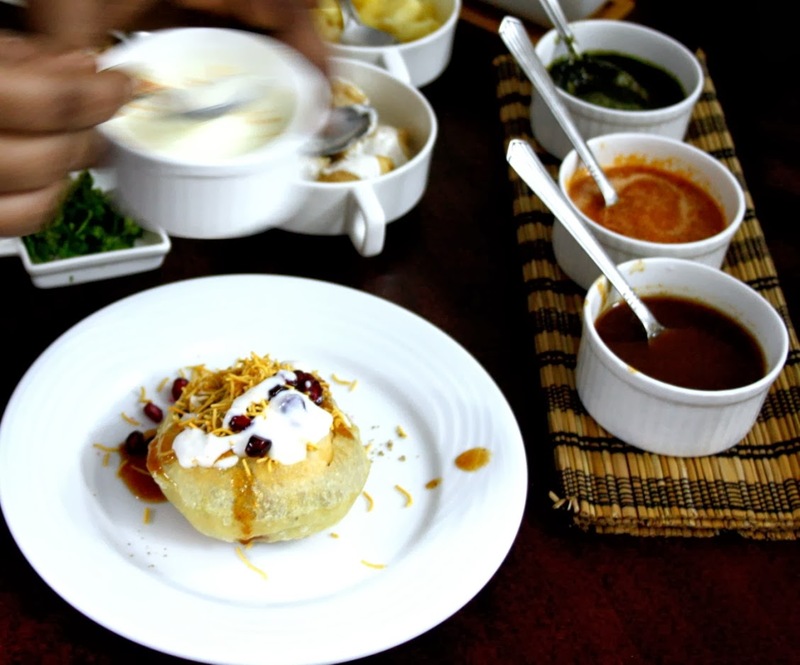 Once the kachori is made make sure you store them in an airtight container. These can be prepared at least a week before. 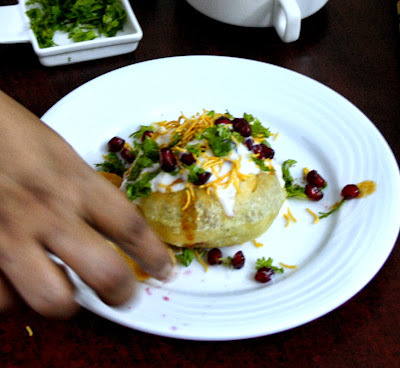 Gently tap the upper layer of the crisp kachori with the help of your index finger.the opening has to be wide. Fill the kachori in the following order.. 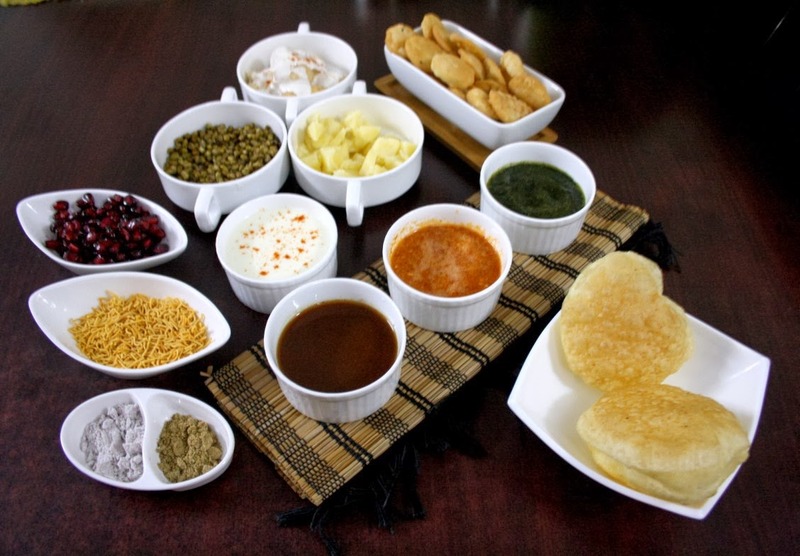 The curd and sauces, dry spices all can vary according to ones taste. The feeling you get when you finally dig into your Raj Kachoris is unbelievable! Everybody loved it and Konda went in for another helping. The best part was Hubby dear saying this was awesome. He is not somebody who says so for a chat! Though the entire process looks and is quite tiresome, if you plan and do dishes in phrased manner, this is a breeze! I am so eager to check out what my ICC members have posted, you can check out their links below!